Elegantly designed to perfection, this high quality, 14k solid two tone gold floral diamond wedding band is a truly unique work of art. High quality, white diamonds weigh a total of 1/2 carat diamond weight (0.50 carats). Band measures 10mm wide (3/8" wide). Diamond Quality: H Color, SI1 Clarity. Also available in all colors, 18k, or platinum by request. 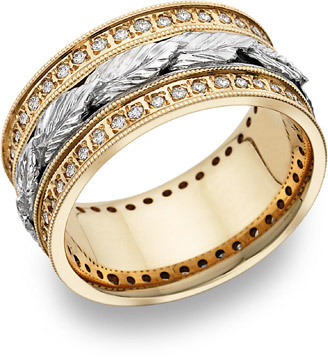 We guarantee our Floral Leaf Diamond Wedding Band, 14K Two-Tone Gold to be high quality, authentic jewelry, as described above.